Large, low-maintenance cypress trees are often used to line avenues or border parks. They are tall slender evergreens or steeple-shaped cones that are prized as long-lived specimen trees in gardens and commercial developments. Established cypress trees with healthy foliage of good color and vigorous growth require minimal fertilizer. The cypress family includes true evergreen cypresses (Cupressus) as well as deciduous false cypresses (Taxodium distichum) and a cross species hybrid discovered growing in Wales in 1888 (Leyland cypress). Their forms range from the baldcypress and pondcypress that flourish in southern swamps to containerized conical Leyland cypress Christmas trees and from tall pencil-shaped Italian cypress to gnarled Monterey cypress surviving in two groves along the Central California coast. Cupressus (Monterey, Montezuma, Italian and Arizona cypresses) are long-lived, fast growing evergreen trees that prefer well-drained soil. Up to 100 feet tall, their branches grow close to the trunk when young. Mature Monterey cypress branches spread out and flatten at the top; Italian cypress trees grow into tall slender columns; Montezumas form fatter steeple shapes; and Arizona cypress are wide pyramids. Cypress grow in soils with a range of pH factors. 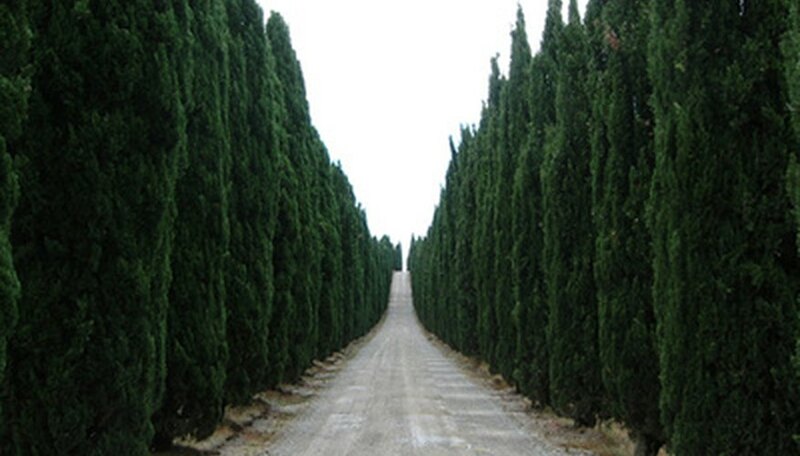 Italian cypresses prefer fertile soils, but the others will grow in nutrient poor soils. Gardeners should test their soil and replace any missing nutrients before planting cypress. Nitrogen, phosphorous and potassium are the major nutrients, but trace minerals like iron, zinc and manganese are important as well. Compost or fish emulsion adds healthy microbacterial activity. Fertilize cypress trees with a root stimulator their first year and a balanced mix with an addition of organic compounds like compost or fish emulsion until their third or fourth year. After that, cypresses need fertilizer only they lack vigor, color or fullness. Young cypress trees have a natural conical shape. Monterey and Leyland cypresses are popular either as cut Christmas trees or as living holiday trees or garden pots. They adapt well to containers as long as the soil is well drained and they get enough sunlight. They require minimal fertilizer.